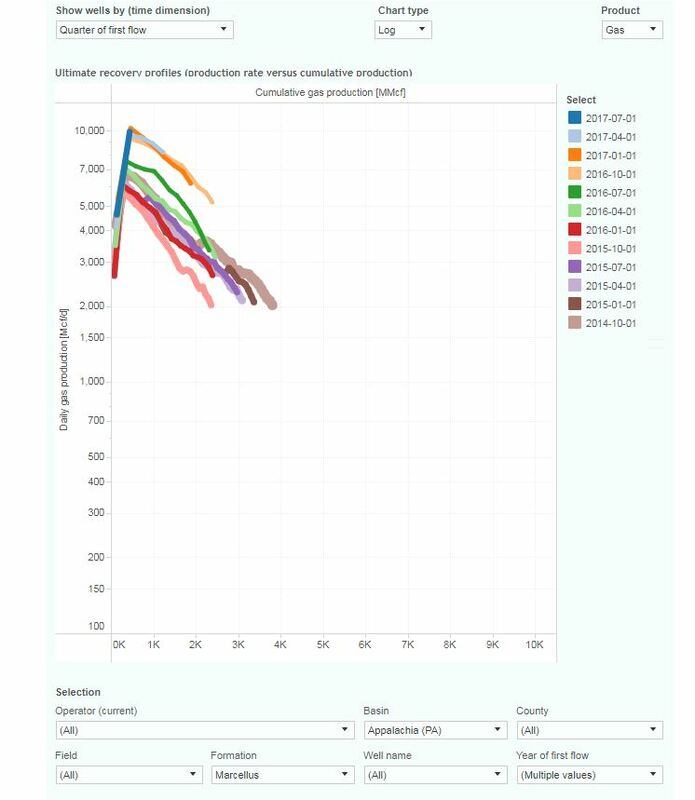 This interactive presentation contains the latest gas (and a little oil) production data from all 8,063 horizontal wells in Pennsylvania since 2010, through October 2017. Preliminary data has October 2017 gas production in Pennsylvania marginally lower for the year, at just above 14 Bcf/d. Wells that started production in 2017 peaked substantially higher than wells from earlier years, as is visualized in the 3rd tab (“Well quality”): 9.9 MMcf/d vs 7.4 MMcf/d in 2016. Drilling activity has markedly increased since early 2016, as can be seen in the “Well status” tab, especially if you select only the status ‘1. Spud’. The top chart in the “Top operators” overview tells us that the 2 leading producers, Cabot and Chesapeake, have merely maintained production in the previous 3 years, while the number 3 and 4 (Range Resources and EQT) are catching up. On the 5th tab (‘Productivity over time’) the average cumulative production in the first 2 years is shown over time. If you reduce the measured period to e.g. 12 months, the significant gains in initial production in the recent 2 years becomes visible. Longer laterals and far larger well stimulations are important factors behind this. Early next week I will have a new post on North Dakota. I would think the chart below from your excellent data set would cause some worry among those who worship at the altar of ever increasing EUR. Not unusual behavior in these plays thus far and the value of this big data portal. The IP could be further improved next couple years with 15K feet super laterals etc. Right now, majority is 10K feet on average. I have to say there is a limit to the EUR of each well’s unit lateral length, the ever improving IP and EUR is already making 6BCF each 5,000′ lateral quite possible. Then, assuming 30% recovery we are talking about each 1,000’x5,000′ section should have gas in place just shy of one third of the world’s best conventional gas field, the PARS in the Persian Gulf. The PARS has only 18BCF gas in place each 1,000’x5,000′ section. With the total area much larger, and upper Devonian and lower Utica and possibly Black River, Marcellus is the de facto on top of the crown jewels in the world natural gas fields. Appreciate your response below regarding the dry and wet gas areas. Just to be clear though- you said 6 BCF per 5000′ lateral with the average lateral of 10,000′ which makes the average well 12 BCF and not 6 BCF. I just threw 6 BCF out there because one can discern a trend in the graph above to fall short of that number. To each his own. I look at the above quarterly graph and say take a look at the Haynesville historical behavior and see a 6 bcf average being a real stretch. I agree that your Q graph above is not able to convince majority that quite a portion of Marcellus wells will reach 6BCF. I should have been a little more specific — “the majority of core dry gas areas should reach 6BCF EUR”. The caveat here is that lots of the wells are not dry gas but rather wet gas, and they will not be able to put out 6BCF as dry gas wells. The averaged results will be bringing down the EURs of those in the dry gas cores. If you look at the top 4 E&P companies, Cabot, CHK, Range, EQT all have majority of dry gas wells and their EURs reaching 6BCF is not BS. On the other hand, Chevron’s majority is in the wet gas zone, and they will never reach 6BCF. 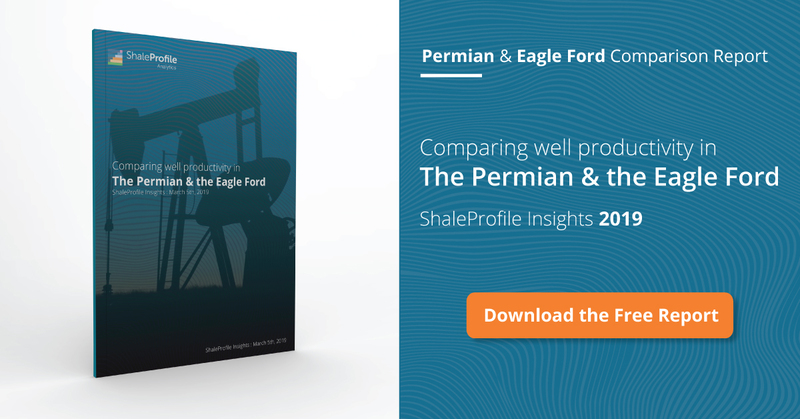 Marcellus and Haynesville are not the same — they are not. Haynesville is 100% dry gas, and their IP in 2013 is already higher than Marcellus IP 2016. However, the drop off of Haynesville is way faster than Marcellus. The resulting EURs of dry gas wells are quite different. Re: 6Bcf being a stretch … Of the 7,720 wells listed above, almost 900 – close to 9% – have already surpassed that figure. When taking into account these are mostly 7 years old or newer, the completions and targeting primitive compared to the most recent iterations, and the earlier years were a frantic rush to hold acreage (still far from being done considering the size of this play), expecting much higher recovery figures in the future should not be surprising. Of the many trends occurring in the Appalachian Basin, one of the more significant is the ‘bridging’ underway between the heavily drilled northeast and southwest areas. The Utica is now the primary target in Tioga and Potter counties, and Consol, Seneca and others are working west to east with many new Utica wells. Of particular note is XTO who just drilled a Utica in Indiana county, about 25 miles east of the noteworthy Gaut well (Utica) from Consol. The Gaut was one of 3 Utica wells that had casing pressure at the 10,000 psi range. Should XTO’s well be successful, it could substantially increase the Utica’s footprint. The most recent, most productive Marcellus wells are producing over 1 Bcf per month for several months running. Interesting finding Jim. I also frequently find that more granular data can give new insights. I’m a Newby here but have been following Enno’ s website for some time. I’ve been drilling wells mostly in Canada for over 30 years. I was in the North Dakota and witnessed the excitement back in 2011. I don’t know what price point would spur a big increase in rigs/drilling, but the massive build out in pipeline capacity coming online in 2018 could push operators to fulfill contracts. Last 3 months of 2017, Ferc okayed 7.5 Bcfd in new pipe … the equivalent of the Haynesville. I think something like 12 Bcfd new capacity should be operational in 2018, plus both Mariner East 2 and 2X which should have about 500,000 bbld NGLs to Marcus Hook. Entire AB output is now about 27 Bcfd according to Genscape. Department of Energy is projecting a doubling of AB output to about 16 Tcf/year 30 years out. I think these guys will be busy for awhile. My guess is less than $2/mcf. Thanks John. So even if we use the $2/mcf and 6BCF of produced gas, ignored op costs and pipe line tolls, we are looking at $12 million of revenue per well. What may I ask what is the average cost to drill and frack these wells? John, $2.20/MMBTU because, essentially, shale gas producers can’t keep their credit cards it their purses anymore than shale oil producers can. So use $1.30 or so net back at the WH and lets see how many 12,000 foot/12M pound laterals ever get to payout. Jim, a PE and a ‘check book’ producer, is right; whatever the IP180’s are on that stuff they then, clearly, start free falling off the cliff. 10% of 8000 wells does not make the play and productivity is not the same as profitability. First, let’s look at Susquehanna County in Pennsylvania. As you already know this is a major county for Marcellus production and US production. This county was basically at zero production 10 years ago. The November production data according to Pennsylvania’s Oil and Gas data was 112,639,301 Mcf. That equals 3.8 Bcf/d. According to EIA the average dry natural gas production for the US average around 76.5Bcf/d for the month of November. So Susquehanna County produced about 5 percent of all the dry gas in the us in November. Now let’s just look at Cabot’s acreage in Susquehanna County. Susquehanna has around 832 square miles (532,480 acres) of surface land. Cabot leases around 179,000 acres or about 34 percent of the county. Cabot’s acreage is in the best part of Susquehanna County. According to Range Resources there is 150 billion cubic ft. of gas in place per square mile on Cabot’s acreage. Cabot has about 280 square miles of leases. So if we assume 150 billion cubic ft per square mile, then we can assume 42 TCF of gas in place on Cabot’s acreage. So here is where it gets very interesting. Cabot will only be able to recover about .30 percent of gas in place. So that is around 12 TCF of gas. According to Pennsylvania’s Oil and Gas data Cabot has around 600 wells that have produced already 3.45 TCF of Gas. It we assume these well will produce over the rest of their life 7TCF of gas. This only leave around 5 TCF of gas left. According to Cabot they say they have more than 3,000 drilling location on these acreage. If anybody believes that I have a bridge in China I can sale you. Let me explain why. Susquehanna county only has the Marcellus present according to Range Resources. If Cabot does have 3,000 location at the recovery rate they talk about 4 BCf per 1,000 ft. lateral, Cabot would produce 32BCf per well assuming an average well with a 8,000 ft. lateral . That would be a recovery rate of 96 Tcf on those wells plus the 7 TCF for a total of 103 TCF. Pardon my language but that is BS. That would be a 200 percent recovery rate. You can’t break the laws of physics! I doubt there is 300 billion cubic ft. per square mile of gas and a 100 percent recovery rate. I say all this to say the Marcellus is getting close to peaking. The peaking should start showing up in late 2019. I have much more data but that is just one county. By the way the same thing happened in the Barnett, but the difference is there is more gas in place per square mill in the Tier 1 counties of the Marcellus. We know how the Barnett turned out. Once again you can’t break the laws of physics. We as a nation believed the hype that shale will save us. I guess we shall see. I share the same concern as you about shale gas and maybe shale oil E&Ps are hyping the EUR numbers while violating the basic principles of physics and chemistry. Yes, according to your calculation above and my post further on top, the gas in place each square mile in the core of Marcellus, e.g. Susquehanna County, is just as good as the PARS in Persian Gulf. But, Cabot seems to have already tested down spacing to 500feet and it showed some interferences, and their current 3,000 drilling spots are based on 700feet in fill spacings. Also, you have to read Cabot’s “BS” (I put “” here assuming Cabot is one of the least aggressive or most profitable/honest E&P shale gas companies) carefully. They actually has two stacks of Marcellus each 100~150′ and 250′ thick, separated by a carbonate deposition in the middle, in their acreages in Susqueshanna. And they claim that the current wells are only producing from one of the two stacks, and so this means they could double the number of their drilling sites. So, the gas in place in this core of the core of Marcellus could effectively get doubled without violating Physics/Chemistry principles. Part of their downspacing tests above at 500′ spacing are actually from such two stack structures and has to be interpreted carefully. I want to further share some of my thoughts on the EUR numbers of shale gas. 1. The EUR as well as original gas in place (OGIP) per square mile for Marcellus core is just as good as some of the best conventional resources. The ultra-high EURs might not be fatancies by E&Ps, but rather real. For example, I am looking at 30% recovery and OGIP of Marcellus is close to 4BCM per square kilometers (this is based on PA NE core acreage where Cabot and CHK is), while the largest gas reserve in the world, PARS, owned by Iran and Qatar, has OGIP of 5.2 BCM per square kilometers. 2. The OGIP is so large that it could not be explained by the current shale gas generation and storage model. The amount of gas generated based on the OGIP and TOC in place seems to indicate each gram of TOC needs to generate over 500~600mg of gas. The highest ever reported gas generation is only 300~400mg of gas for each gram of TOC, and most others is under 200mg of gas. This discrepancy seems to indicate that gas should be generated elsewhere and or other thermogenic processes might be responsible for such large generation numbers. The above two issues are something that “we don’t know we don’t know” or “we don’t know we (Enno) just already know”. They are totally against the predictions by shale gas bashers who predicted that shale gas could in noway compete with conventional gases. In China’s Fuling shale gas field, the numbers of the highly productive Fuling wells seem to indicate it is close to the average of top 30~50% Marcellus wells. Experts in oil and gas industries are continuing being shocked at the numbers, as the average EUR is already more than 2 ~3 times their original estimates. Some claim the gases actually come from further below and then migrated to the impermeable shale reservoir!!!?! FWIW, Susquehanna is always associated with Cabot. However, Southwestern also has much acreage just to the north of Cabot and has only recently started to produce. Their 2 Walker West wells have produced 1.3 Bcf each first 6 weeks online. Coffeeguyzz, where do you get production info on new wells? The database I use does not have data as recent as that. Would love to know. Marcellusgas.org posts the numbers about a day or so after Pennsylvsnia’s DEP releases them. November’s numbers are already published. I find it an extremely informative site, but it can take a while to learn how to navigate. My guess is that it is an extension either of Penn State of the DEP itself as a main focus is on royalty payments. The search function is especially useful as one can target specific formations (Geneseo, Rhinestreet, Burket, etc) on a county wide basis to keep track of the status of non Marcellus wells. Although the Upper Devonian and Utica wells are a small fraction in Pennsylvania, they are increasing in number and output. right, can’t find McGavin 6 here either. I appreciate your analysis on this site.